For years, Anne Farkas was a warm, welcoming sight at Restoration Hardware. Her huge smile was familiar to every customer. Her green hair — that’s new. It all started with Brent McCreesh. The Westporter was 3 years old. He’d spent over a year in the hospital, battling neuroblastoma cancer — only to be put in isolation at home for 6 months. He missed the nurses, staff and volunteers who played with him nonstop. He pleaded with his parents to go back to the “fun” hospital. Then he met a few fantastic volunteer caregivers. One was Anne. By then she was working at the Fairfield Public Library. She helping bring joy into Brent’s life. Every year, Anne puts on an enormous bow tie and green leprechaun cap. She greets everyone at the Westport Weston Family YMCA’s St. Baldrick’s. She’s also a prodigious fundraiser. She said when she reached $3,000, she’d add green highlights to her hair. At $5,000, she’d dye her hair green — and at $7,000, purple. Now she’s set a new goal: $10,000. 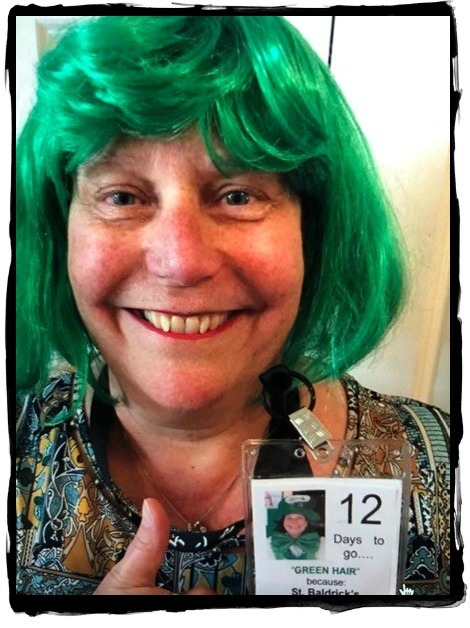 When Anne reaches that amount, she’ll shave her head at St. Baldrick’s. The event is set for next Sunday (March 24, Westport Y, 12 noon). 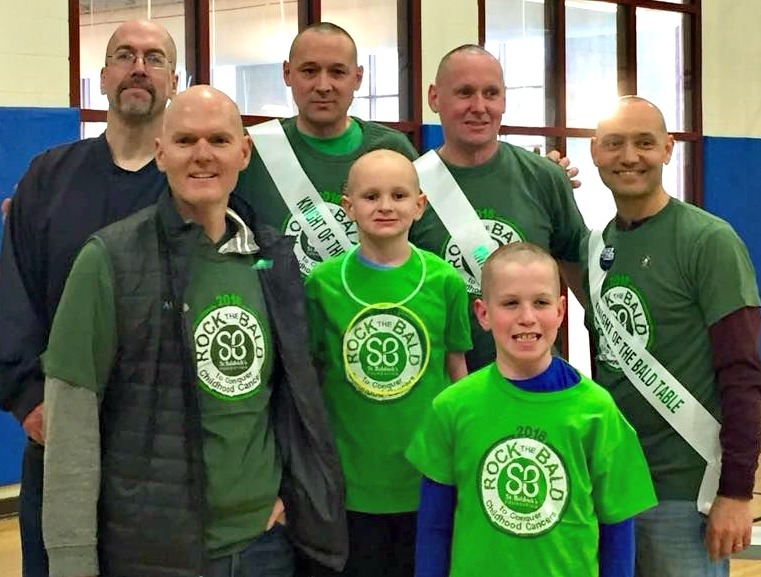 This year’s St. Baldrick’s is the last one for Anne and “Team Brent.” After 15 years, they’ve decided to focus on helping new groups grow. They know what they’re doing: So far, they’ve raised over $4 million. 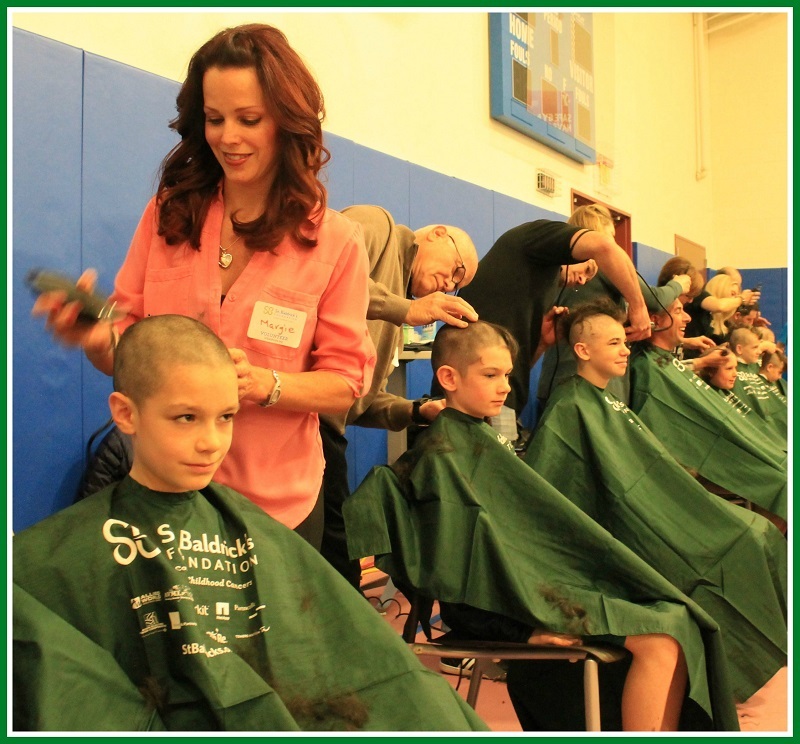 Taking it all off for St. Baldrick’s, in 2015. As always, this will be a great day. Head-shaving is done by volunteer stylists; there’s head painting too (and photos! ), all while a DJ spins tunes. There are inspirational speakers (hosted by sportscaster Deb Placey). Anthony Capalbo — whose son Charlie, a former Fairfield Ludlowe High School hockey player, has battled 2 cancers — will talk too. Brent McCreesh will be there. He’s now 16 — and has been cancer-free for over 13 years. He’ll take on comers in a challenge chess match. All funds will go to St. Baldrick’s. Who doesn’t love a bald guy? This entry was posted in Children, Organizations, Teenagers, YMCA and tagged Anne Farkas, Brent McCreesh, Charlie Capalbo, Dana McCreesh, St. Baldrick's. Bookmark the permalink. We all rest in the shade of trees we did not plant. It’s warriors like Anne who lead the way for us all. And she looks FINE in purple hair. Thank you to everyone who has ever participated or contributed or in any way supported events to fight childhood cancers. I’m filled with gratitude each and every day for those that came before us to plant the seeds for current research.